A “snaky” start to the new year….”Snaky” isn’t one of those words I find myself writing very often and when I typed it into the title of this post, it was bugging the heck out of me…just didn’t look right. Spell-check wasn’t touching it, yet I wasn’t going to be happy until I had Googled it to make sure. It was then that I read that “snaky” in informal English in Australia and New Zealand apparently means angry or bad-tempered. When I say “snaky” here, I am referring to the fact that the Chinese New Year, which will start on February 10, will herald the beginning of the Year of the Snake. And why do I know this? Well, a Facebook friend shared the above image from a page called “The Journey to the Revelation of my Soul” and I saved it simply because….. I like the COLORS! I am thinking that I must weave something with this color combination some time. Well, I kind of did in my sampler pictured above… but not quite. I want that rich burnt red background and that special shade of blue. Whoa…is this the structure and process person speaking?… now getting all excited about color? Another reason the snake image appeals to me is that I happen to be starting the new year weaving a snake-like motif into my latest wall hanging project. I like to think of it as a boldly-patterned snake winding its way back and forth across the cloth. The pattern is based on one of the designs that Wayuu weavers work into their belts. Imagine my surprise when I got Mirja Wark’s book off the shelf, in which she describes and names the designs, to find that the particular pattern that I have been using as my inspiration is called pasatalo’ ouya which means “like the intestines of a cow”! Okay…so, I am weaving a wall hanging with representations of cows’ noses and intestines. But, since I adapted the basic motif a lot so that it would be big and bold enough to fit the space in which I am working, I think I could allow myself to call it snaky instead. What do you think? Sloooow going. I am not achieving the four finger widths which my teachers tell me is a good day’s work. Some days I am lucky if do three. It is, however, very exciting watching the pattern slither its way up the fabric. It is giving me both a mental and physical workout, I can tell you! It is an extremely dense two-heddle complementary-warp structure and opening the heddles is hard work. 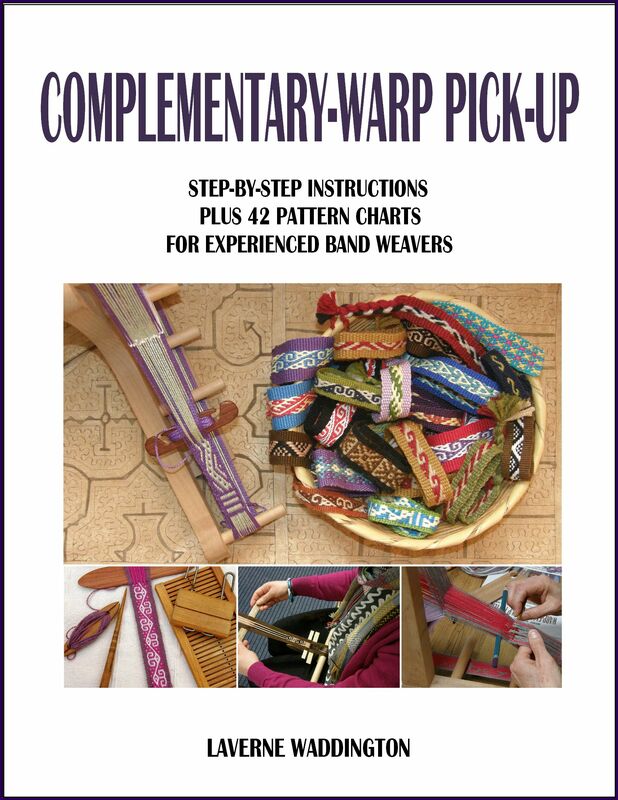 While the tiny elements of pattern within the main shape are very repetitive and easy to read, there are just so many warps to handle! I feel that I deserve to get up and go eat mango after every pick! I like to think of the figures on this sash that I wove a long time ago as snakes. I copied the design from a textile from pre- Colombian Peru. 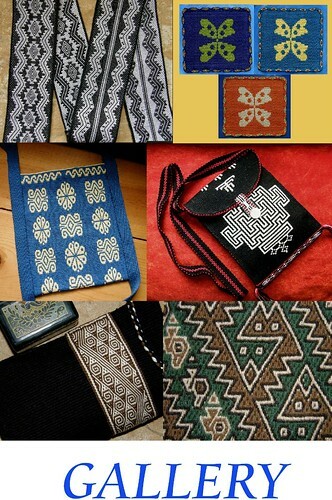 Who knows what the weavers of the original fabric were seeing when they created these motifs on their cloth. The snake is an important figure in Guaraní weaving legends. My teacher tells me that it was a snake that appeared in the dreams of the first weaver and taught her the weaving designs. When Guaraní weavers of the Izoceña group weave the zig-zagging snake skin patterns in their cloth they are also representing the Isoso river along which they have settled. The snake and the river are one. I wove Guarani inspired snake skin designs into this guitar strap. I was told that this is one of the reasons why many Guatemalan women weave richly colored sashes to wrap about their heads and around their hair. The sashes vary enormously, in width, length, color, design and weaving technique from place to place. It is also interesting to see the different ways they are worn…. …and by this sash weaver in Zunil. Wishing you all the very best for the new year surrounded by completely non-“snaky” (in the Australian sense of the word) folk! Lovely pictures. 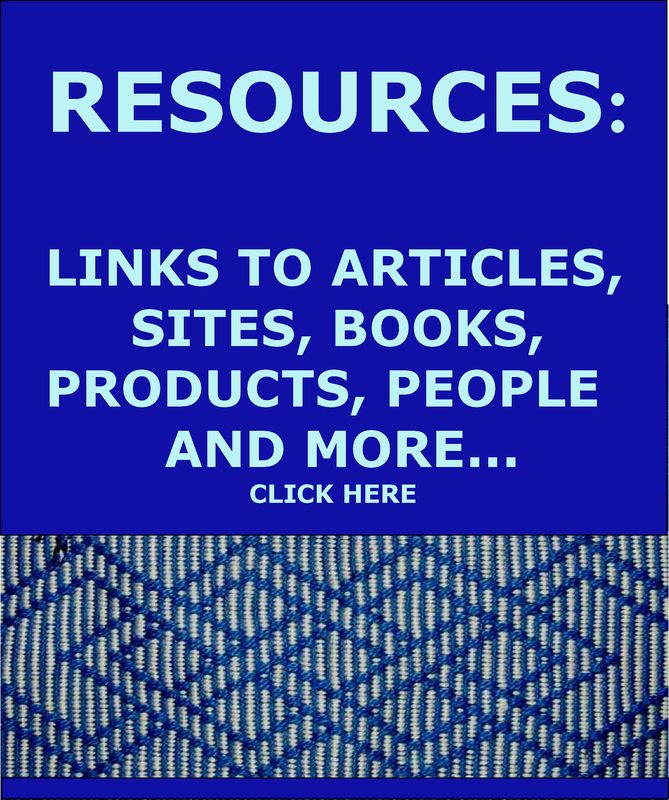 A couple of your pictures in the blog look flattened? Thanks, Franco. I am not sure what you mean by “flattened”. Everything at my end looks okay so I am not sure what I can do. Let’s see if others mention a problem. Happy new year, snakes or not! I never have enough time to thoroughly explore your blog, but I always enjoy it so I’m subscribing now anyway:-) Love the idea of the burnt red background with gold, etc. Congratulations on your first band. Using the frame of a rigid heddle loom works well and, as you have found out, choosing the right yarn for warp-faced weaving is very important. Sound slike you are having fun! About charting….I don’t have a tutorial that shows you how to create and adapt. I think that once you have woven a certain structure many times, you will get a feel for how what you see on paper translates to your weaving and how the weight of the yarn affects proportions making motifs sometimes more squat or more elongated on the cloth than on the paper. By simply weaving and weaving more you will teach yourself how to go about making adaptations and in the end create your own designs. You will see that ceratin structures have a certain kind of chart. 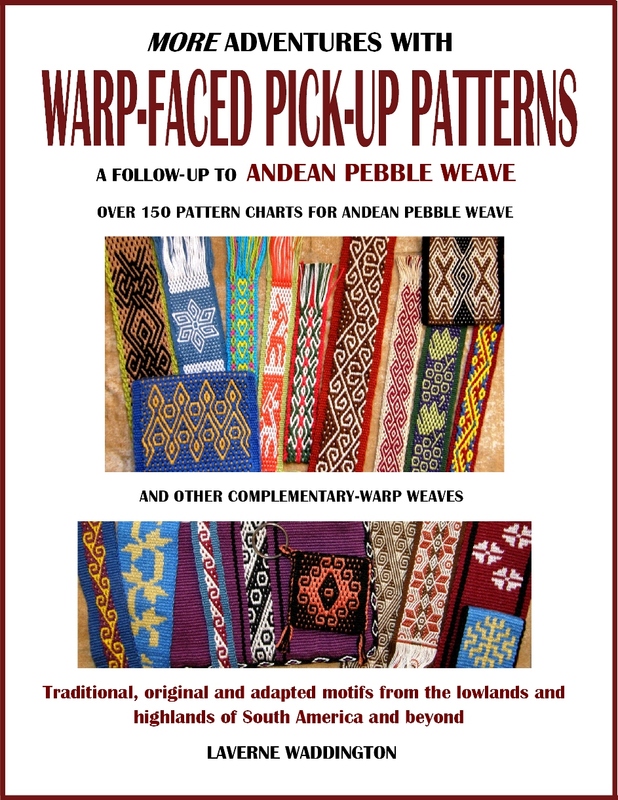 The chart for simple warp floats is not the same as the one for double weave…very different structures. So, my advice is to familiarise yourself with the structures by doing lots of samples with them and take it from there. Adapting designs is all about sampling and trial and error. This is one of the many good things about the backstrap loom. I can quickly and easily warp up and weave a tiny sample to check a pattern I have just charted and then make any necessary adjustments.This is something I might have to do over and over until I get it right. 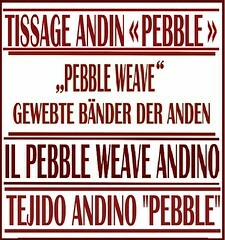 in my second book I have tutorials on charting for pebble weave. Hi Laverne, thank you for the congrats and for the information! Certainly I need to weave and weave and weave much more! Have only made one complete “serious” thing as a test, and already ended quite nice.. that means a lot to me because then I understood quickly how things go 😉 -hope I’m not wrong-. Thank you again for your advices! Beautiful, as always, Laverne. You most certainly can refer to your weaving design as snaky! 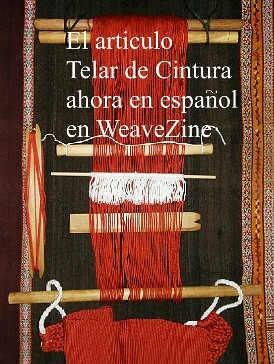 Thank you and may 2013 be filled with good health, much joy and continued weaving excellence. How great that weaving is a good workout! Thank you, Julia…same to you. Yep, backstrap weaving is a good workout-keeps my tummy flat! Ah ha! So that’s your secret for remaining so slim! Off I go to weave. I am moved by your query: ” Who knows what the weavers of the original fabric were seeing when they created these motifs on their cloth.” It is one of the many pleasures of weaving that we have an opportunity to connect with images and symbols that have been used for centuries, and we too become part of passing them along. Thank you for adding your ponderings along with your inspiration Laverne. I like to think of how the images we work with will persist long after we are gone, as they have passed through the nimble fingers of many who have gone before. Weaving certainly affords us a quiet time to reflect on the motifs we weave and the cultural meanings that are associated with them! Estimada Laverne, tuve la oportunidad de conocerla personalmente, en Cuzco, en el Encuentro de Tejedores, soy chilena, artesana textil, y admiradora del trabajo maravilloso que usted realiza. Deseo sinceramente que este nuevo año, esté cargado de nuevos viajes, y experiencias maravillosas. Mucho éxito en lo personal y profesional. Y espero reencontrarnos, en otro Encuentro internacional.